With RoomSketcher, it’s easy to create high-quality 3D Site Plans. 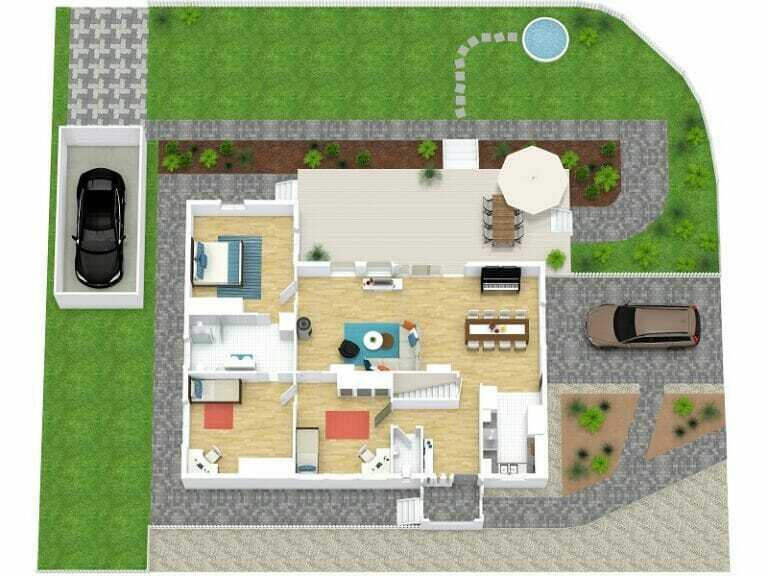 Showcase the landscape layout of your property in beautiful, full-color 3D. Perfect for real estate marketing, landscape design, and home improvement projects. Create beautiful 3D Site Plans online with RoomSketcher, the easy-to-use site plan software. With RoomSketcher, you can create 3D Site Plans online using your computer or tablet. The easy click and drag interface makes drawing a site plan easy to understand and straightforward. Simply click and drag to draw your property layout. Integrated measurement tools will show you the length and width, as you draw. Then add landscaping materials, plants, and outdoor furnishings to complete your site plan – it’s that easy! While you draw your site plan in 2D, our state-of-the-art rendering technology creates your 3D Site Plan for you – automatically! Use the camera in the app to preview how your site plan looks in 3D or view your 3D Site Plan in interactive Live 3D. When your site plan layout is complete, generate your high-quality 3D Site Plan – at the click of a button! RoomSketcher 3D Site Plans are high-resolution and optimized for both print and web. Print and download your site plan to scale in either a PDF, JPG or PNG formats. 3D Site Plans are an excellent way to illustrate a property layout. In this example, you can see all the outdoors areas the property has to offer, including a garage, an enclosed backyard, and a large deck with outdoor dining. 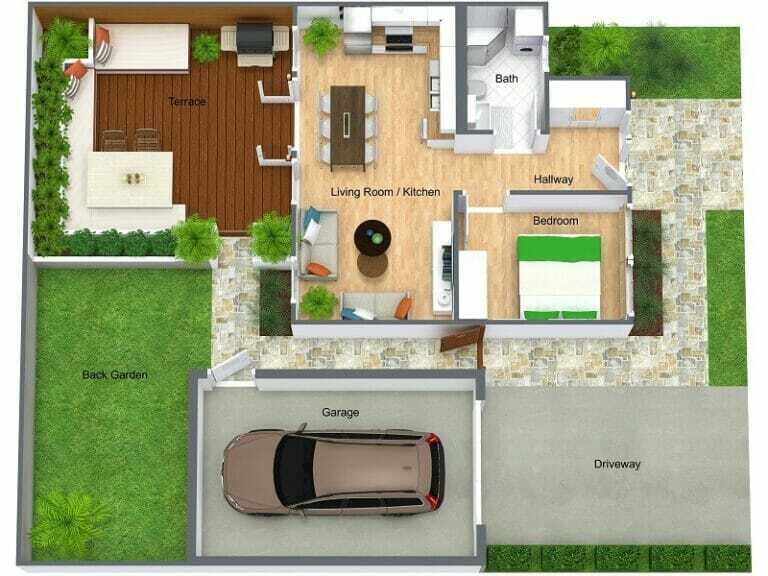 The 3D Site Plan makes it much easier to understand the property layout and instantly see its potential. 3D Site Plans are ideal for landscape design because they make it easy for the viewer to visualize how the design will look. 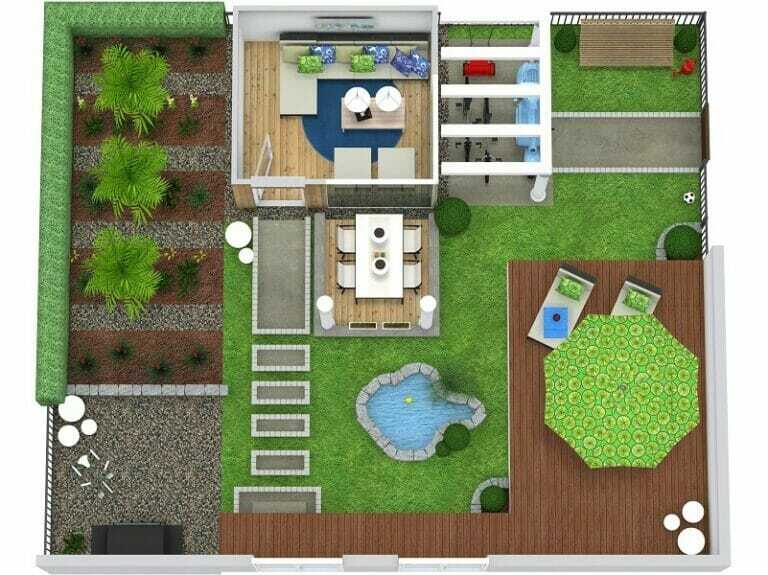 This 3D Site Plan shows the landscape design of a back garden area. Although it’s a relatively small space, the garden has lots of great outdoor features such as an outdoor kitchen and dining area, a jacuzzi, a sun deck, and an outdoor seating area with a fireplace. 3D Site Plans are really helpful for creating backyard designs. 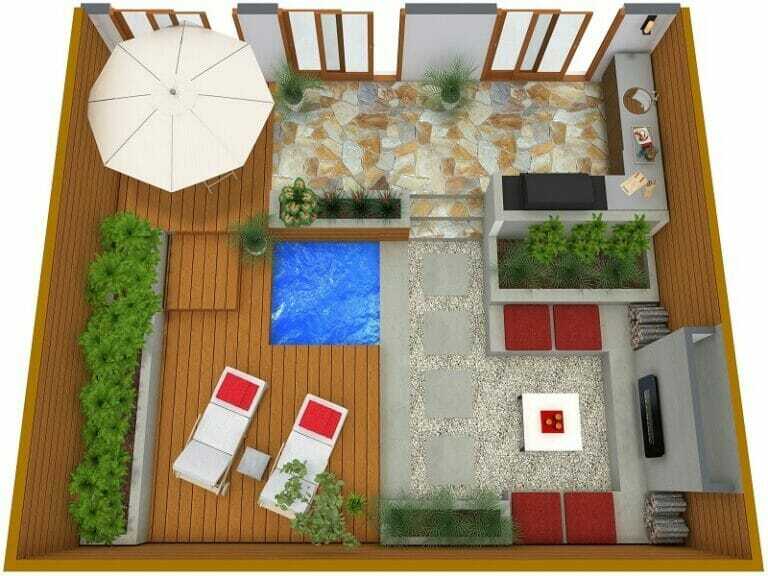 In this backyard design, the 3D Site Plan makes it easy to see the elements that make up each area including the landscaping materials and outdoor furnishings. This makes it easier to visualize how each space will look, how it can be used, and which materials will work best. With RoomSketcher, it’s easy to create 3D Site Plans for your real estate, landscape design, and home improvement projects. Learn more about using RoomSketcher as your Site Plan Software.